next to CTHAR Extension Services (Map) on the UH Maui campus. Time Pupus will be served at 6:30 pm and the talk will begin at 7:00. Please CLICK HERE to view the Photo Gallery Page for this event. 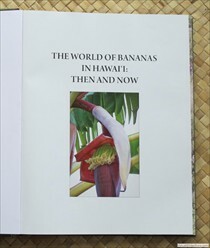 Our guest speakers for the evening are Dr. Angela Kepler and her husband Francis Rust authors of the new book “The World of Bananas in Hawaii: Then and Now”. A few words of introduction cannot begin to describe the wealth of information found in this book. It begins with the amazing seafaring migrations of pacific islanders who brought banana varieties (mai’a in Hawaiian) with them. 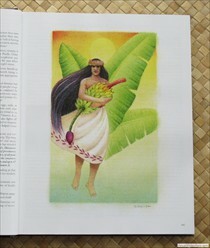 Over time the mai’a evolved into distinct Hawaiian varieties. There is an extensive discussion of the origins, habitat, propagation and uses of all distinct varieties complete with pictures plants legends and folklore. These Hawaiian Mai’a especially when cooked are known to be the tastiest bananas on earth. 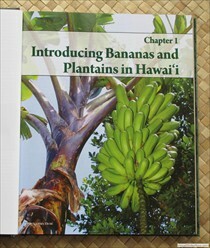 It is no wonder that Angela and Francis proclaim that their staple carbohydrate is the traditional Hawaiian bananas. 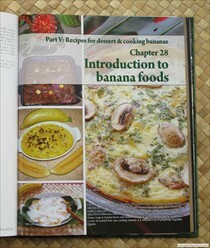 They even provide the recipes they use for cooking and serving bananas. But that was then how about now. There is a complete discussion of the bananas introduced into Hawaii post-contact. Again the origins, habitat, propagation, and uses are thoroughly discussed. There is also a section on planting, harvesting, fertilization, pests and pest control. This book is truly a work of passion. One to be treasured. And yes books will be for sale at the meeting.